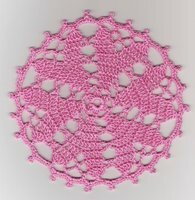 The Crochet-A-Long selected the "Design 555" from Celtwich site, it has 3 doilies. An oval pineapple, a star, and a swirl. Since we did a pineapple already, I've selected the swirl. Yesterday I spent swatching, trying to find the perfect combination of color, thread and hook. It calls for a #8 hook with #10 thread, but I tend to work loose and usually have to drop down 1 or 2 hook sizes. I don't have a #9, so I started with a #10 hook and light blue thread. Very tight and it cupped a little, so I moved up. The #8 and #7 I have are in-line hooks, so I went all the way up to a #6 and dark blue thread. The stitches are too loose, so I went to the #8 with the dark blue, the stitches look a lot better, but the thread is splitting badly. I'm going to have to go with the #10 hook until I can get out and buy some new Boye tapered hooks. So I try the #10 hook with a light orchid thread. Love the look, and finish about 15 rows, but it's cupping very badly. I pin it to the blocking board and give it a light steam and leave it pinned overnight. 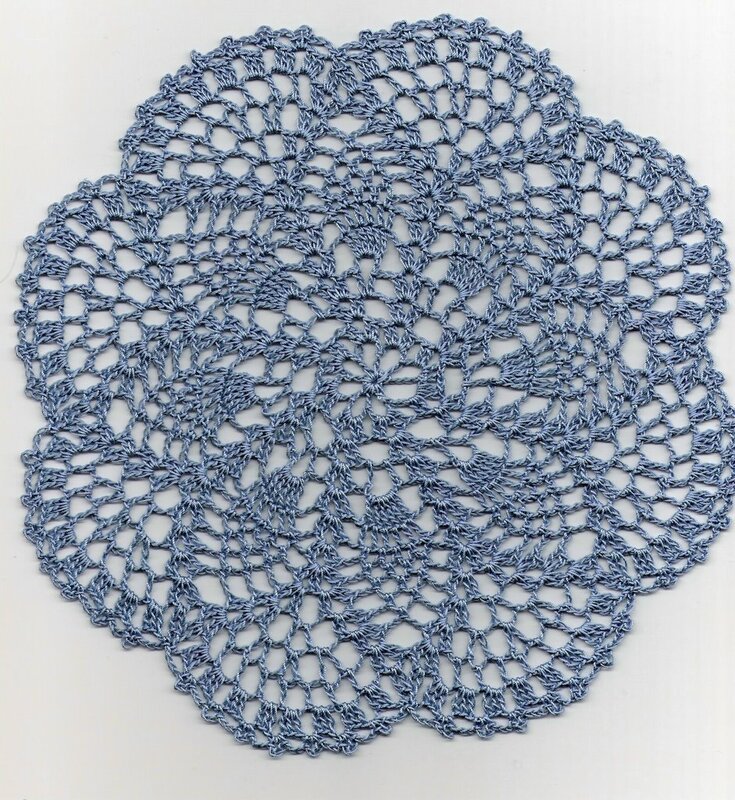 I'm enjoying searching for doily patterns right now. The Crochet-A-Long posted the beginner doily, the Heart's Desire (below). The more advanced CAL pattern will be posted on Thursday. 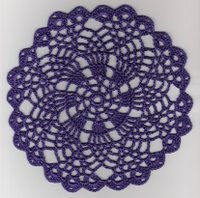 So until then I'm looking at a variety of sites, trying to find a doily I want to make for this year's county fair. 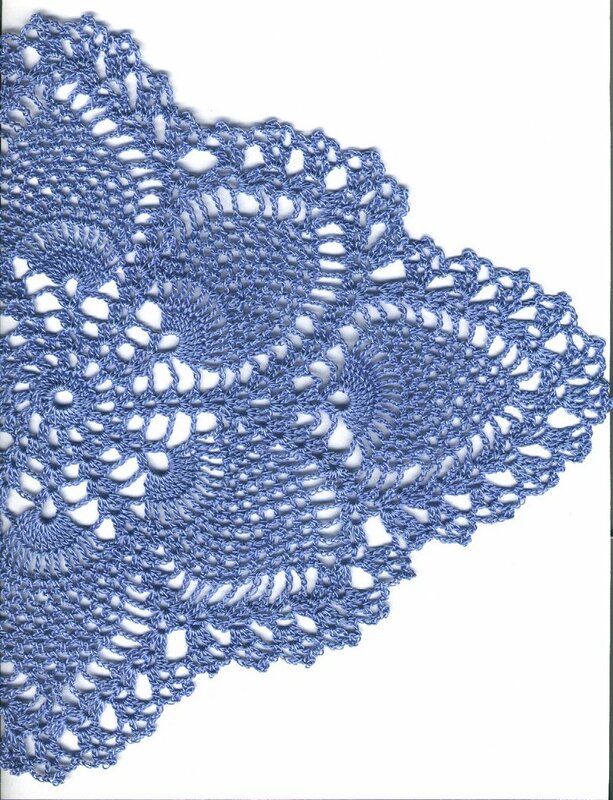 I spent hours this evening looking at the beautiful work on this site "Rinrin's Crochet Lace"
She unfortunately does not list any information on where to find patterns. So, I will have to spend more hours searching. Here are some of my favorites "Sweet Pea"
I also made a little doily from the Coats & Clarks site, called "Heart's Desire Doily". It's in a bright pink. These pictures were scans done before blocking. So today was doily blocking day. I set up the ironing board in one of the girls' bedrooms. Hey, one is at college, the other working in Alaska for 3 months. I have a few months to use both rooms as "stash supply room", craft central! Anyway, I made copies of a blocking page I have, lined them up on the ironing board and pinned waxed paper over them. I then sprayed the doilies lightly with water. I'm a gentle blocker. Some people soak the doily in liquid starch, wring it out and then start stretching & blocking. I spray it lightly with water & gently shape it. Then pin it along the blocking lines. Then I spray with a light spray starch, the kind that say "light, crisp look" or something similar. Then I hold the steam iron about 5 inches above the doily and let the steam penetrate for a few minutes. Do not let the iron touch the crochet, we're not ironing out wrinkles, we're letting the fibers get damp and warm, which causes them to relax. Then the light starch sets the doily in the position pinned. 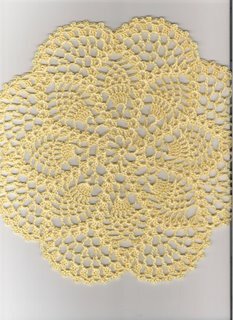 When dry, the doily is not stiff like a piece of heavy cardboard, it's still very flexible, like fabric, because that's what it is. I use a very light, gentle hand when blocking. I think I forgot to credit the pattern on the first crochet-a-long doily. It is Priscilla Hewitt's "Petite Pineapple", check out the pattern. Check out our "Crochet-A-Long group", too. 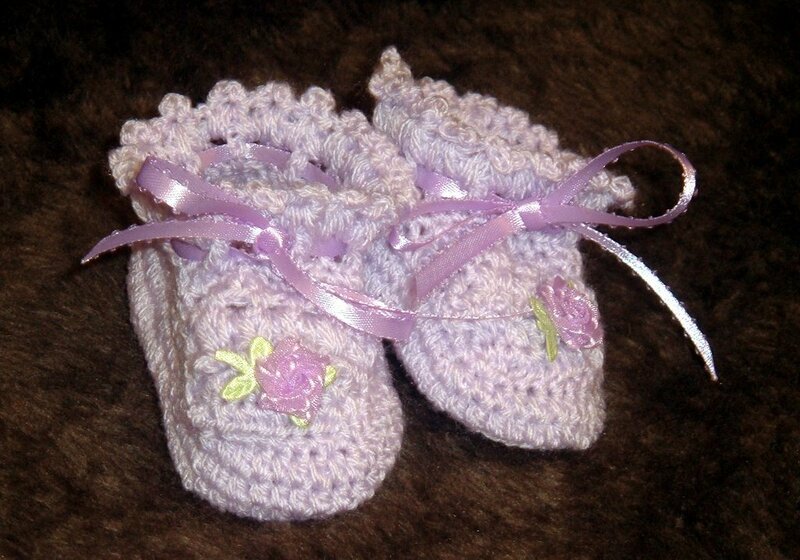 The group now has moderators for several crochet-a-longs, groups for thread, granny squares, toys and garments. 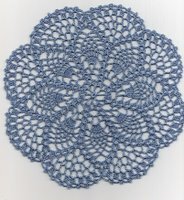 I finished a second doily using the Petite Pineapple pattern. 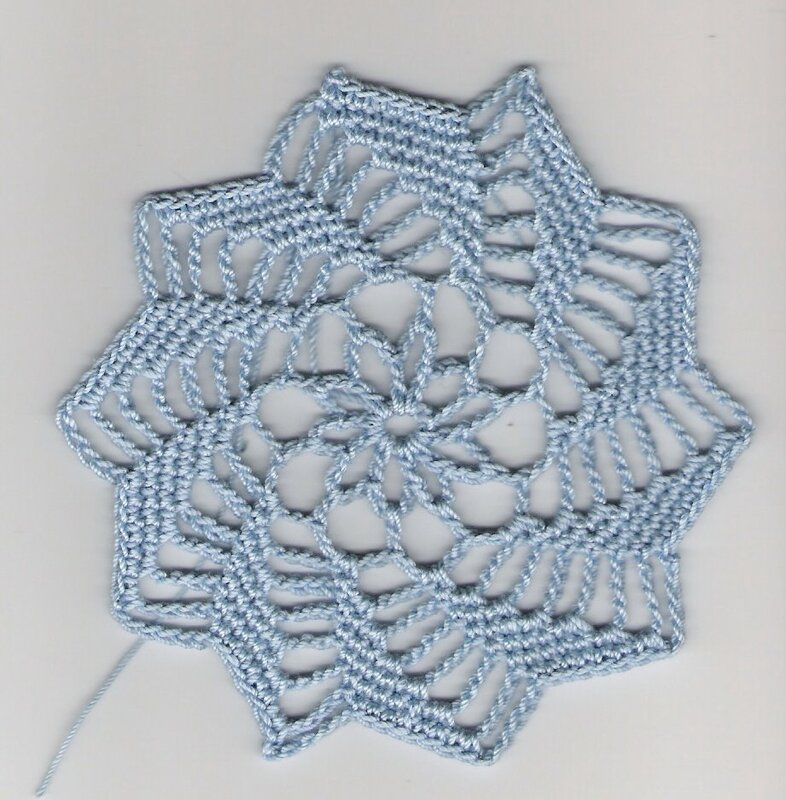 I used some of the #20 Cebelia that I had from the oval pineapple doily. 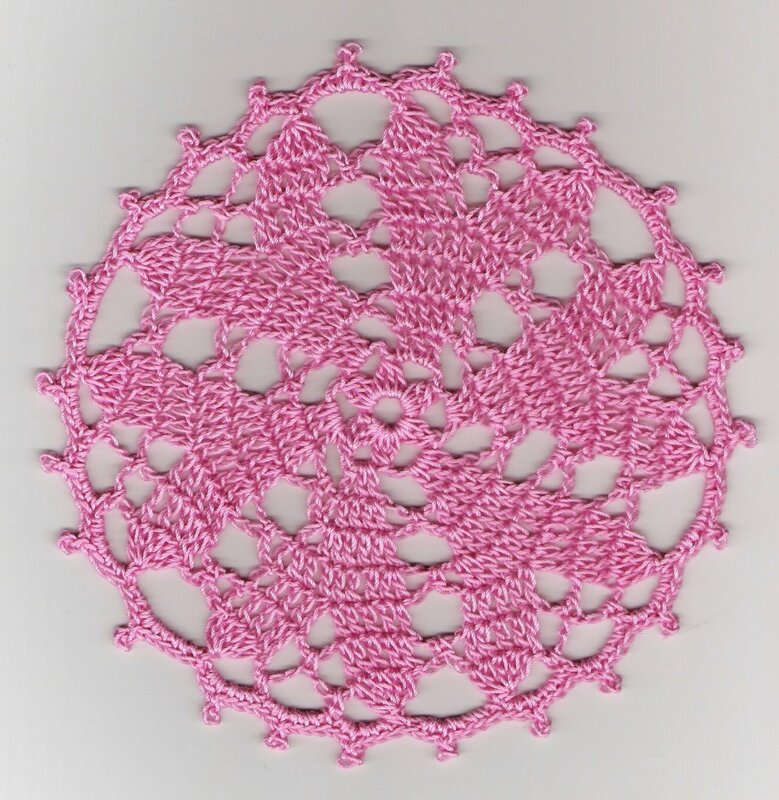 It was called simple pineapple doily, 1946. The pattern is no longer available on the site where I found it, but I think it's up somewhere else on the web. If I remember I found one in purple, and one in a variegated. The variegated thread didn't show the beauty of the pattern itself though. I'm thinking of framing these 2 doilies, when I get the tablecloth framed, and using them as an art arrangement in my front entryway. One of the booths that I checked out at the Farm Show was the Keystone Lace Guild. What caught my attention? 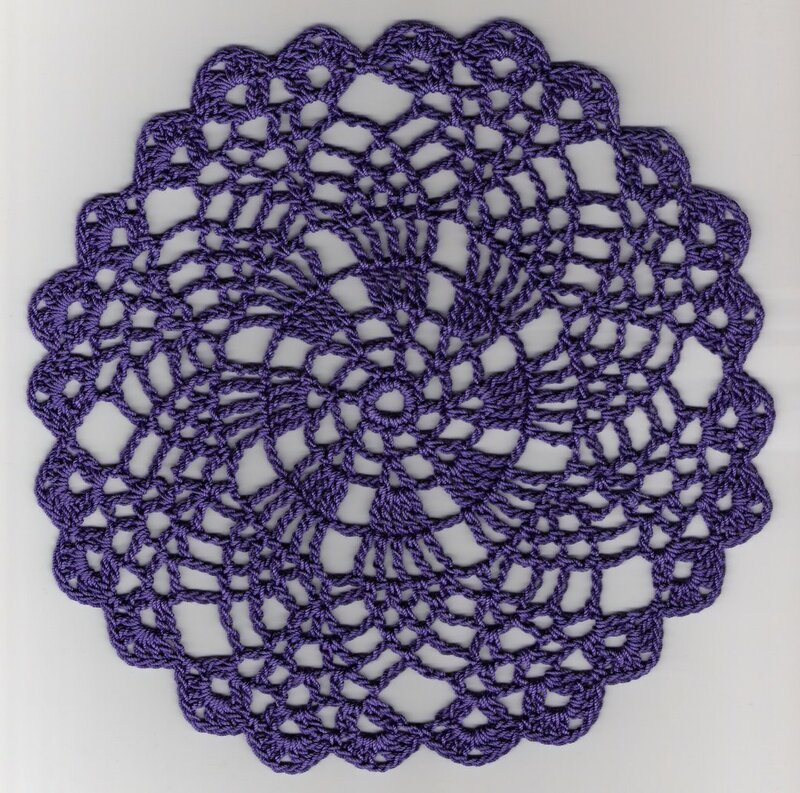 The crocheted doily as part of the display of lace items including knit, and tatting. The books and patterns included Pauline Turner's book Crocheted Lace, you can check it out on Amazon here "Crocheted Lace: Techniques, Patterns and Projects"
Along with information on the Lace Guild and their Red Dress Challenge, I picked up information on the Central PA Gathering of the Guild and Crafters' Market. It is Saturday, Feb. 25, from 9am to 4 pm, and included displays, demonstrations and workshops in all types of lace making methods including crochet. "Central PA Gathering of the Guilds" The lady I spoke with was interested in a chapter of the Crochet Guild of America being involved. I put the information out in the Professional group of CGOA and have had some email from a lady in the Three Rivers CGOA chapter. She may be able to get her guild in to display, if not there will be some individuals attending. I've got this on my Crochet Calendar things to do! Hope to see some of you there. Noreen Crone-Findlay is a fiber artist that I've noticed recently. She has published books on crocheting dolls, she also teaches this at CGOA conferences. 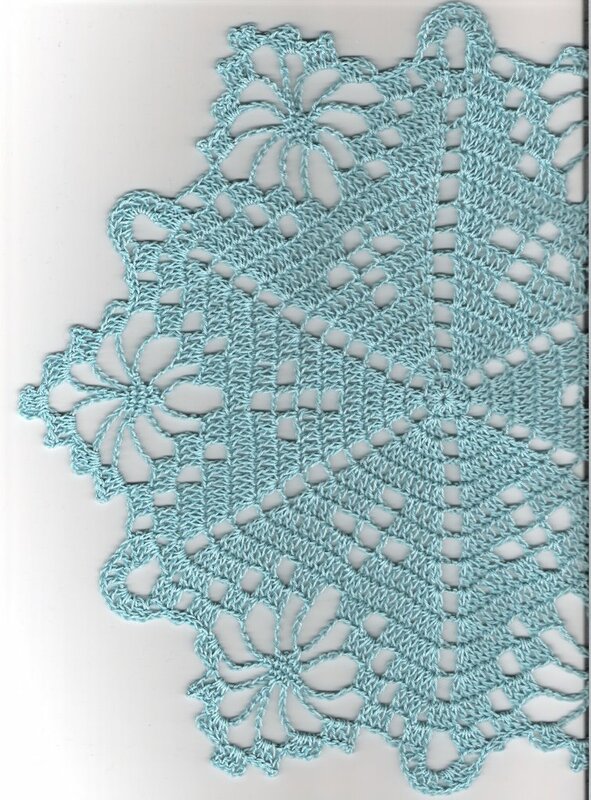 She has a beautiful blog entry about lace and frost, pictures of frost on trees, crocheted lace shawl, poems, it's fabulous. "Mother Nature: the original lacemaker,..."
This week I bought a new magazine, it's published by Woman's Own and it's titled 33 Super Easy Projects to Knit & Crochet! AFGHANS. I don't think I need super easy projects, but if we support the industry by buying the publications, they should keep publishing for us. The crochet patterns covered a great variety of styles - granny square, motif, ripple, mile-a-minute, mitered blocks, crochet with cross stitch design, afghan stitch. There is a gorgeous afghan called Reversible Rainbow that uses post stitches to create squares of colors on one side, and stripes on the other! In addition to afghans, there are pillows, ponchos and scarves. The majority of the patterns are crochet, and I think I would make every one of them. There are book and product reviews, how tos, charts of hooks and needles, links, articles such as how to create edges for afghans, and several contests. I also bought a knitting magazine today. Our local Media Play is going out of business and everything is 50-70% off. So the magazine was less than $1.50! I may find some useful information in the articles, maybe an easy pattern I can try, but if all I do is drool over the pretty yarn ads it was still worth the price. Well, don't you know it,...I have no idea where I filed that doily pattern, or where I got it in the first place. Will have to search again later. Well, this has been a busy, fun week. On Monday, I went to the Shawl Ministry gathering, we had about 3 dozen compeleted shawls and about 25 hats. Three people wanted help with how to put the Fun Fur round on, 1 on how to finish the ends, all the hats were great. Tuesday, I went to work and a co-worker & her daughter (my private lesson students) had 6 finished hats! That evening, daughter #2 asked if I could make her an afghan. I've been asking her for a year what color she wanted, but she kept saying she didn't want one. She took a stack of books, and leaflets to her room & selected about 8. Then we sat together and made a final decision on pattern and color. On Wed. I finally got a chance to get to the PA State Farm Show, our equivalent to a State Fair. 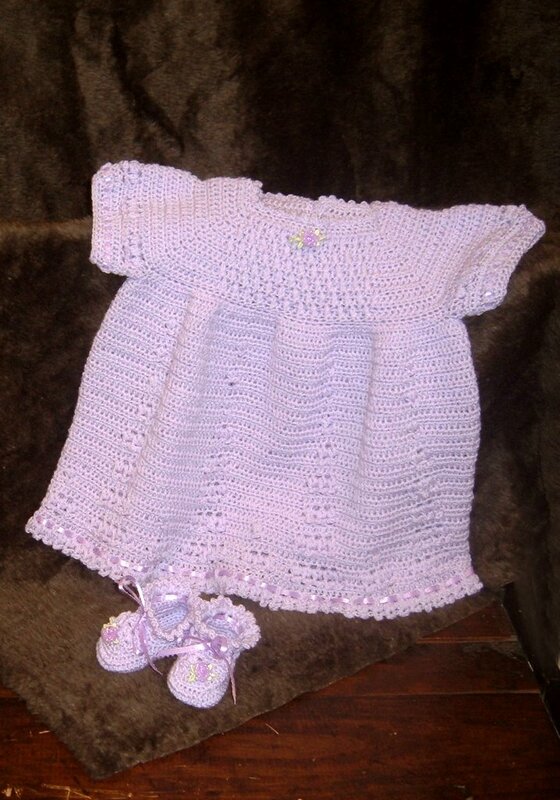 I had entered 3 items, my doily placed 2nd, the baby dress 2nd, and the matching booties 3rd. I'm very pleased with that. Wed. evening DH went with me to AC Moore and I bought the yarn for the afghan and got started on it almost immediately. Then she asks if I could make her a hat. Her boyfriend bought her a jacket for Christmas and a white Magic Scarf, so she wanted a white hat. Luckily I had bought 6 skeins of Homespun off eBay figuring it would make a nice shawl, or I might work it into an afghan design. I selected a pattern called Addison Hat, but had trouble trying to work stitches into stitches with the Homespun. I created my own hat, using shells, and working the next row of shells into the ch 2 space of the shell. I made it extra long, and turned up the last 3 rows, so it's doubled over her ears. I just found an interesting way to use my scanner. I scanned the Pineapple doily (see below), then I clicked on edit, and adjust color. I then slid the button along the spectrum and the doily changed colors. It's a pale yellow, so the colors changed from pinks, to peach, to yellow, to spring green, to mint, to blues, to purple. Then I can slide the saturation button and make the pink into red, etc. 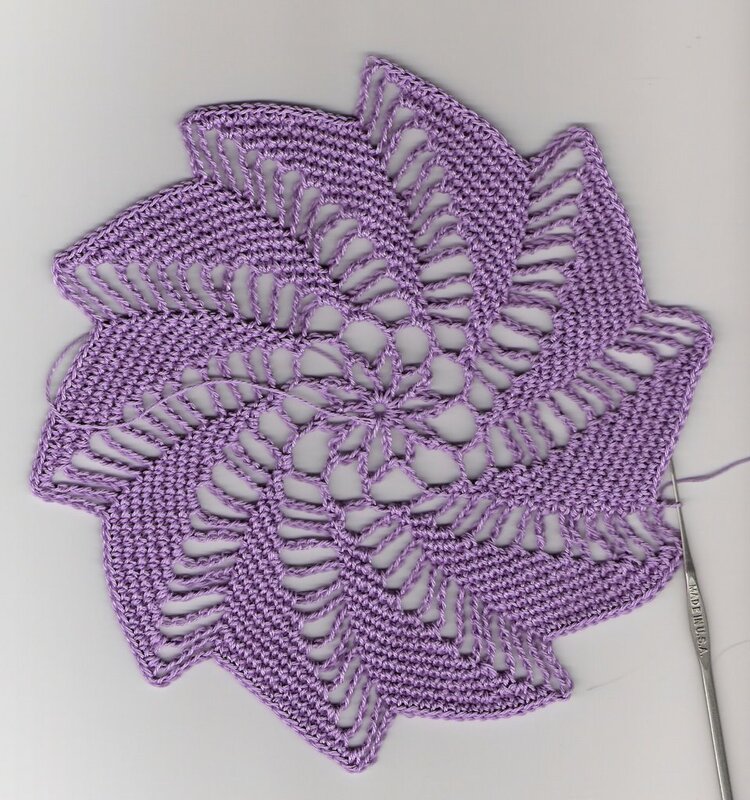 It lets me look at this doily in different colors to decide what other colors I might like to make it. Daughter #2 selected one of the doilies I made this summer and asked if I would make her one in red for her dorm room. The top picture is the doily I made in purple, the bottom is how it would look in red. 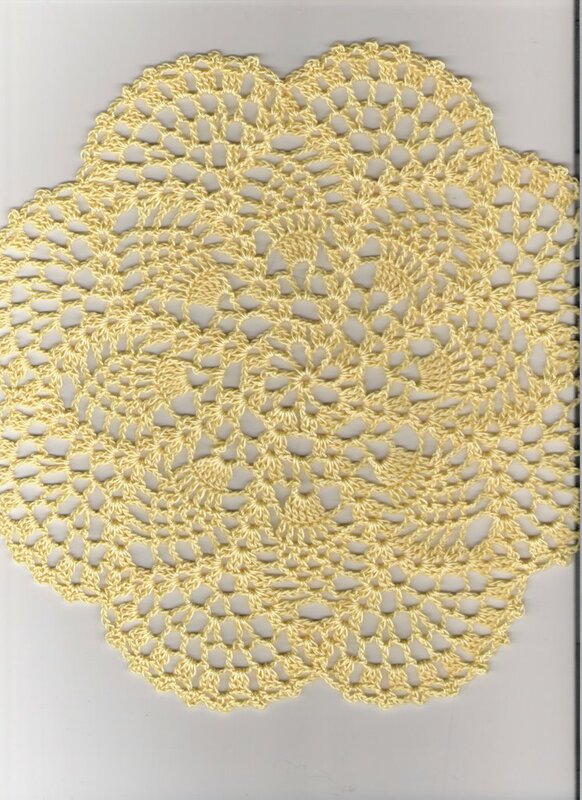 By the Way - you can click on one of the pictures and get a full screen view of the doily. 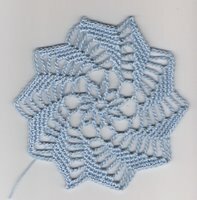 I've joined another crochet group on the internet. Okay, technically it's not a new group, it's a sub-group of a group to which I already belong. Someone on the "Crochet Partners" list suggested starting a crochet-a-long, and the response was positive. Several ladies took charge, set up a group site on Yahoo, put together a poll of what type of patterns to tackle first, selected patterns, set up folders, etc. 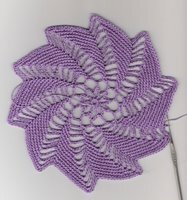 I think that I joined on Wednesday, and decided to work on the doily, the other choice at this time is afghan squares. I did 4 rounds on Wed. evening, rounds 5 - 12 on Thursday,..."just finish this round before going to bed". When I got up Friday morning I found an error on the middle of that last round. So I had to frog half the round, then finish rounds 12 -14. I need to block it, but probably won't get to it until Wed or Thurs, shawl ministry on Mon, teaching & tutoring on Tuesday, tutoring & working on Wed. Oh, it would be nice if I could find a few hours to go see the Farm Show before Friday. Yesterday, my daughter & I stood in the various lines so that I could get registered for the Pennsylvania Farm Show. This is our equivalent to the State Fair. 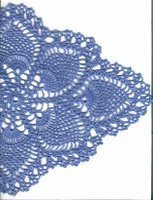 I entered the lilac baby dress and matching booties in the clothing class, and an aqua spiderweb doily in the crafts class. The Farm Show has a lot less categories than the Gratz County Fair, and you may only enter 1 item per class. That doesn't give me a lot of opportunities, but it's still exciting & fun. Yeap, I bought another one! It was my Christmas present to myself, who knows better what I want? It's size J, a beautiful light green, Tahitian Jadewood. It has silver trim, green crystal-type beads and a Lampworks bead that is white with pink flowers & green leaves. Yesterday, New Year's Day, I finished the shawl I was working on. Today, I sat & crocheted while DH watched football. I made 4 of the soft hats. Now I'm starting a new shawl, Homespun in Barrington. This color is gorgeous, a deep purple with bits of aqua and jade.